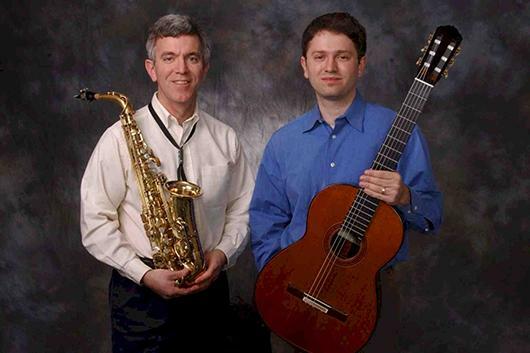 Duo Montagnard (Joseph Murphy, saxophone & Matthew Slotkin, guitar) was formed in 2002 and has performed over 300 concerts in 49 states, eight Canadian provinces, and twenty countries on six continents. Festival performances include the Chautauqua Institution, Scandinavian Saxophone Festival, Hartwick College Summer Music Festival, North-West University New Music Week (South Africa), UNC-Wilmington New Music for Guitar and Saxophone Festival, Radford University International Guitar Festival, and the Alexandria Guitar Festival. The duo has commissioned, premiered and recorded more than twenty works for guitar and saxophone by composers including James Crowley, Jonathan Elliott, Laura Kramer, John Anthony Lennon, John Orfe and Russell Peterson. This master class is free and open to the public.